I am such a push over for anything with bacon in it and so is my family! My mom made homemade macaroni and cheese the whole time I was growing up and I make basically the same baked version for my family. But adding bacon takes this to a whole new level of YUM! I wouldn’t be surprised if I caught my kids eating this for breakfast because it is so good! Adding in that this is actually a slow cooker or crock pot recipe makes this even better. I am sure you avid Insta-Pot enthusiasts are already all over this kind of recipe, but for this crock pot rookie, I am still learning the tricks of the trade. I love that this doesn’t require turning on the oven! I mean who really wants to heat up the house when it is already warm and there are times when being able to keep something warm is perfect. Think family gathering here, church potluck, baby showers, or just one of those busy evenings when everyone is getting home at different times. Hopefully you will have left overs because they are wonderful to take in your lunch and heat up in the office. So plug in and get to cookin’! This is once dish you are not going to want to miss! This is what Tammilee of Tammilee Tips has to say about this easy dish. 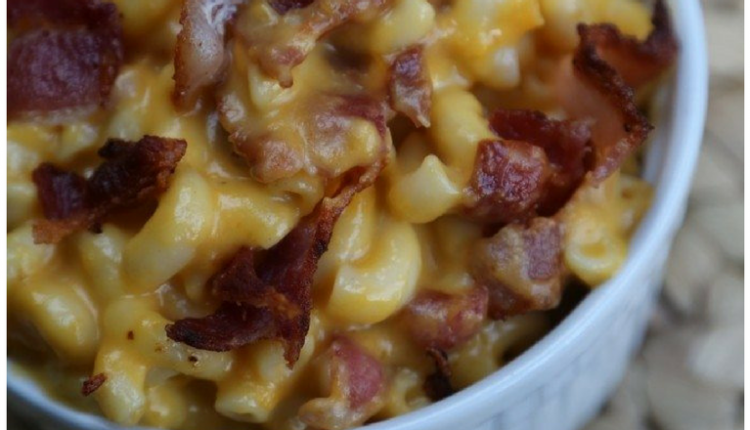 I hear everything is better with bacon, so we made Crock Pot Bacon macaroni and cheese.Bacon does make this recipe even better. Quick Tip: You can also add in a mix of your favorite cheeses such as Pepper Jack..mmmm one of our favorites! So Simple It will Drive You Bananas..Literally!